This is, of course, my last post for the year. As usual at this time of year one does a little reflection. First up we can’t believe that we still on the road after 28 months, still happily living in confined quarters and have only made it as far as Sicily. So far the slow campers have seen 21 countries, but really only explored 9. We’ve driven approximately 26,000 kilometres (in 3 vehicles) – not counting miles in the air, on MoJo, in rented cars, on bicycles or astride camels. I’ve posted 103 blogs, but only 29 this year – my laziest writing year, but at least I’m still at it. Once we hit the ‘The Stans’ and beyond it’ll be more interesting (hopefully) but I imagine more spasmodic. Thanks for following and I always appreciate your comments. 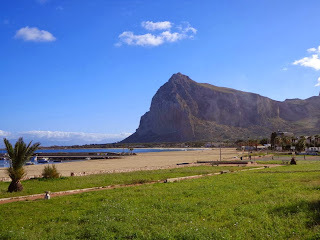 We are now in our winter ‘bolt hole’ San Vito Lo Capo but today the weather is dreary and wet. 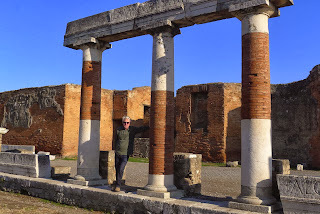 After leaving the Pompei Campsite we spent the day at Paestum about 100 kms south of Naples. 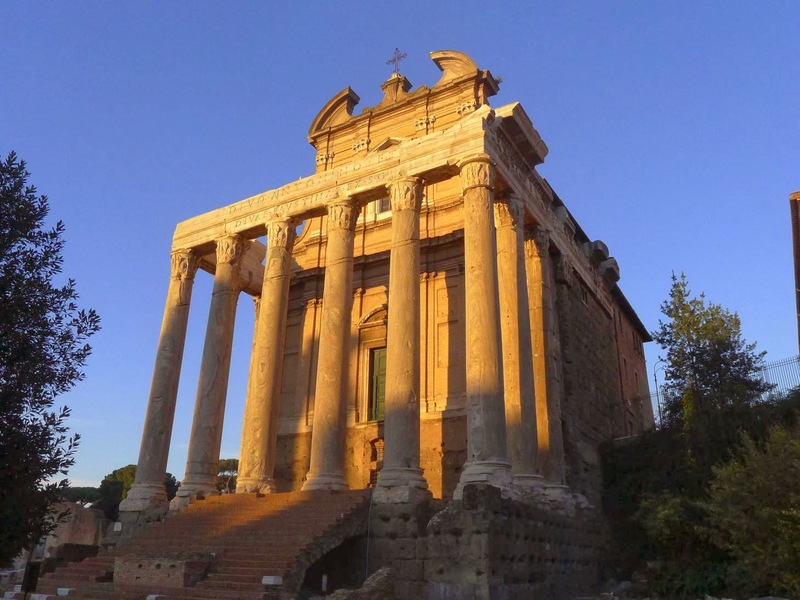 This area boasts the oldest intact Doric Temples in the world and worth a visit. The photos say it all. We left ourselves 3 1/2 hours to make to back to Naples to be on time for our ferry. We needed every second of it as the last 7kms took an hour and a half. I think it’s the worst traffic jam I’ve ever been in. The bloody scooters don’t help. We nearly knocked a few off – should have tried harder. Anyway we made our boat and checked into our relatively spacious 4 berth cabin. We went down to the restaurant for our pre-paid dinner and had the second worst meal of our lives. Fortunately we had the foresight to bring our own wine, thanks to Lawrence, so left our cold pasta and overcooked meat and demolished a bottle of cheap red. Our arrival next morning was terribly early (we skipped the breakfast) and we drove through Palermo and headed straight to the campsite and sunshine. Bliss, but it didn’t last. Christmas morning wasn’t too bad but the winds whipped up at midday and just got worse. We ate inside, so no photos to post. Of course we drank an excellent Marc Chauvet vintage champagne, a lovely Sud Tirol Pinot Noir with our duck and finished with a Jurancon doux to accompany our cheese. 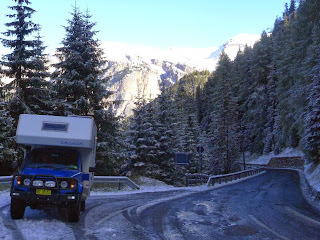 There was a knock on our door at 7pm and a Swiss couple came to pay us a visit as they were interested in our vehicle. These things happen in campsites and we often end up with lovely friendships out of the blue. More wine was consumed so I’m not sure how much sense we made! Boxing Day was just bloody awful. Horrendous winds that kept us indoors all day and awake all night. Things improved for a few days, but now we have rain – oh well, could be worse, could be in the office. We plan to stay here for a few weeks, no matter what. The weather is no better anywhere else and this is a great spot to hang out. It’s a real summer tourist beach spot so very quiet in the winter, suits us just fine. But the best new of all is that Australia have won The Ashes - we now have that ugly little urn back in our clutches. Happy New Year to all – and let me know all your news. We are leaving the Pompei/Naples area tomorrow morning and heading to Sicily by boat. 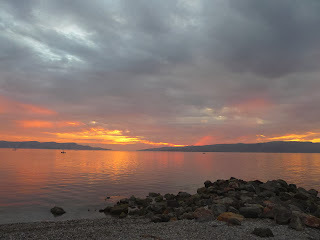 We’ve been warned over and again that the “Autostrada” to Reggio Calabria is treacherous in many ways. The locals say we’ll be robbed blind and the tourists say the road is terrible. It was built in 1974 and has been under repair ever since - apparently. 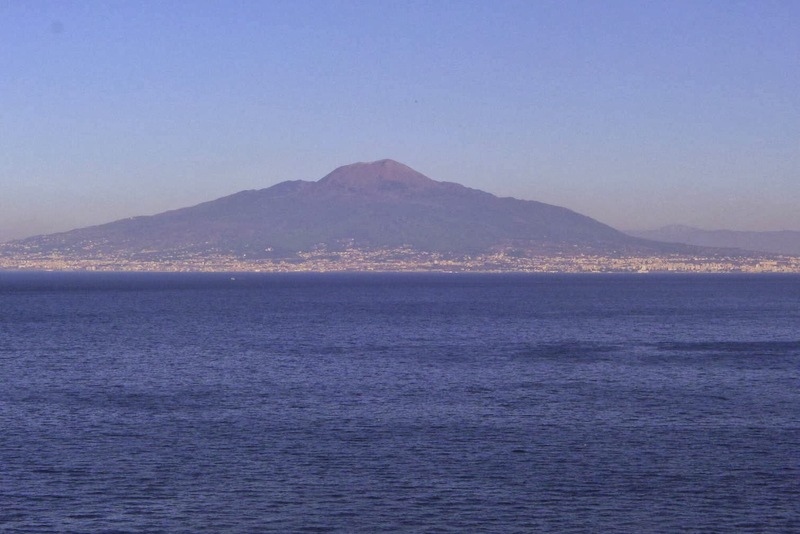 Hence Naples to Sicily the easy way. 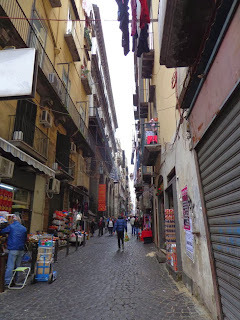 Northern Italians are rather scathing about their southern cousins and when you say you are going to Naples, they roll their eyes and throw their hands in the air. “It’s dangerous” they warn you severely, “be very careful”. Well we survived Naples without being pickpocketed, robbed, mugged, beaten, stabbed or murdered. In fact we saw nothing like this and the whole thing was slightly disappointing. We found Naples a bit dreary and having spent the best part of 2 days there were happy to leave. Sorry to say, but we were also underwhelmed by Sorrento. 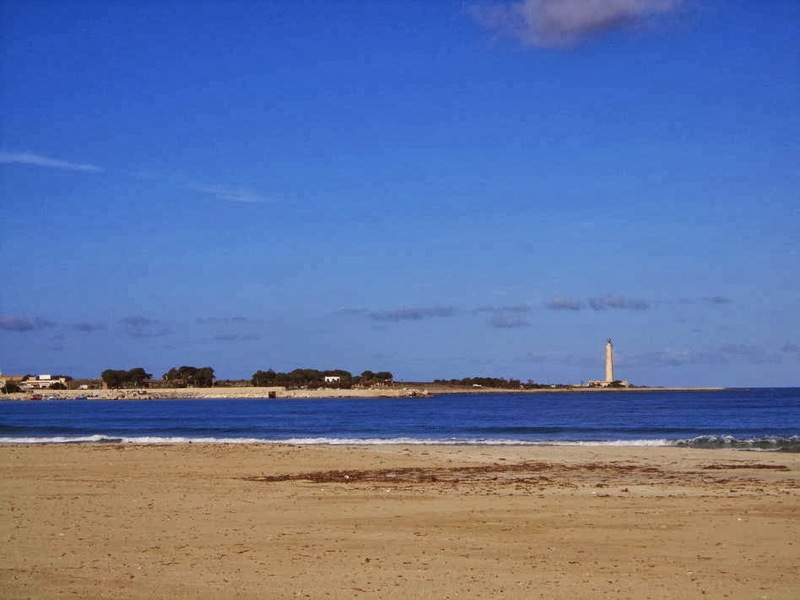 Rather dull and the dramatic coastline is completely over developed and commandeered by large hotels. I didn't even take a photo! However, we were blown away by Positano and the Amalfi Coast. It’s everything you dream it will be. Stunning. 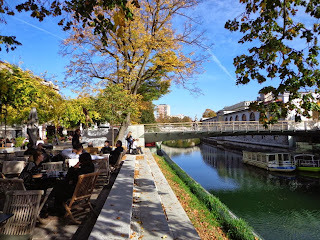 Also we had brilliant weather that day and being south facing, we managed lunch in the sun. 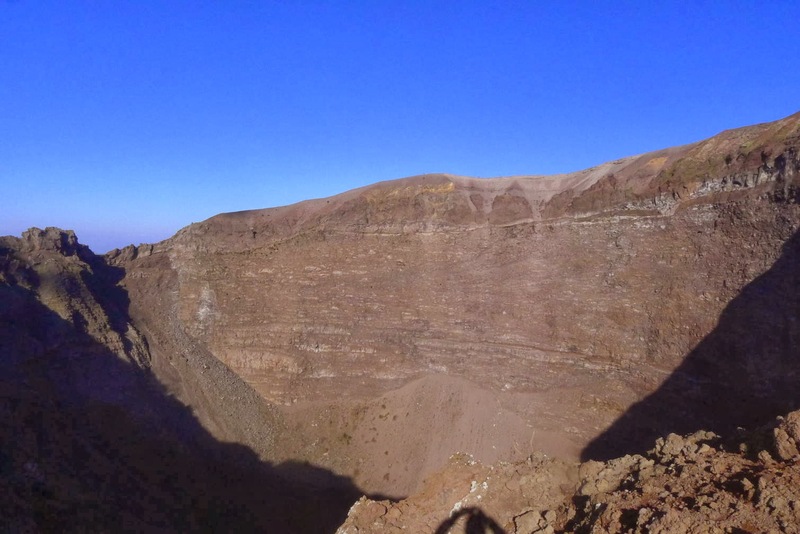 We also climbed to the top of Vesuvius, hoping that this wasn’t the day it would blow it’s top for first time since 1944. It was fabulous to see and there just a bit of steam escaping to remind us that it is still an active volcano. That’s all from me tonight. Merry Christmas to all and see you in the New Year (if not before). We never made it to Norcia and the Apennines – bloody snow again. 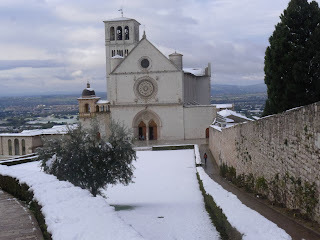 We’d had enough cold weather and snow so just hung out in Assisi and did some walking. Weather was beautiful, cold and sunny. 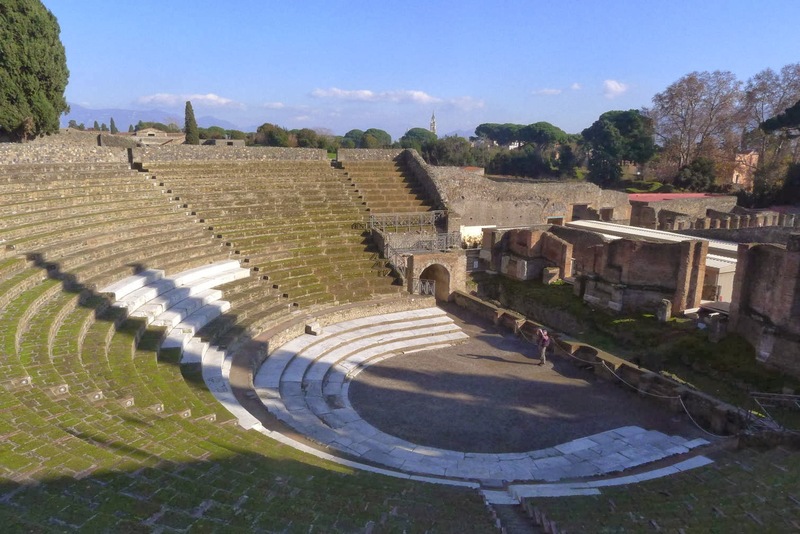 On our way to Rome, we stopped in Rieti. We stayed the night with Julian and his family. Some of you may remember that Julian is the guy that Lawrence bought the Mog from! They’ve stayed in touch, so we decided to pay them a visit. He’s a really fun and interesting guy and his wife Lucia is lovely. We left on the Sunday with farm fresh eggs and 6 bottles of wine!! Next stop Rome! The campsite is outside the ring road so this meant a bus and train into town. We made the decision to spend 2 nights in the city centre, and found a cheap, fabulous, serviced apartment in Trastevere. Day one was spent simply re-acquainting ourselves with this amazing city. Neither of us had been to Rome since the early ‘80s so we were a bit rusty. 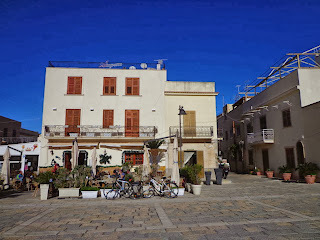 We did our usual thing of stopping in a sunny Piazza first up and having a coffee. Now, we always know that these are going to be expensive, but it’s a nice introduction to a new city. Well!! The bill came and I burst out laughing in disbelief. Lawrence went pale and had trouble breathing – €23.40 for 2 coffees!!! 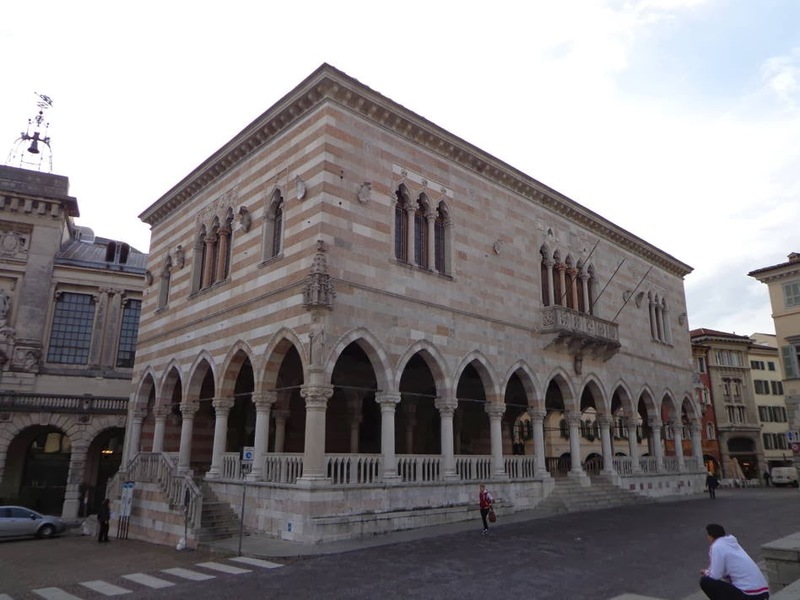 That’s far more than Piazza San Marco – or anywhere in the world I think!! Can anyone beat that?? Then of course we got stuck right in. 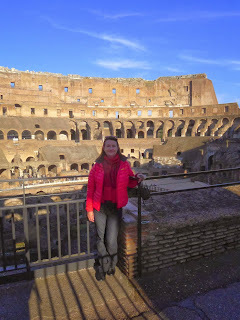 Colosseum, Roman Forum, Vatican City, you name it – we saw it. The highlight for me was the Raphael rooms at the Vatican Museums. 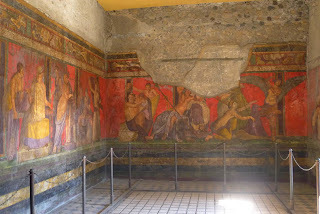 They were so very beautiful, we spent an age looking at these frescos. Thankfully we had taken the binoculars so we could see the incredible detail up close. I thought the Raphaels were much more striking than the Sistine Chapel, which I find slightly disturbing. Michaelangelo had a very strange idea of what a man’s bottom looks like, but if you look closely at the famous ‘Creation of Adam’ painting, under the God figure is a young man with a VERY cute bum. Worth taking the binoculars for!!! Of course we did loads of churches, St Peter’s, the Duomo, Pantheon and so on. A highlight was the byzantine mosaics in Santa Maria Maggiore. Some of these were not in great condition and the lighting was terrible, but they were really worth seeing. You need to look behind the monstrous baroque altarpiece. We met more Aussies in the campsite, who again gave us the lowdown on Sicily – over quite a few bottles of wine and great meal cooked by Lynne. 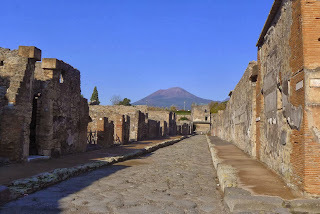 From Rome we headed straight to Pompei. 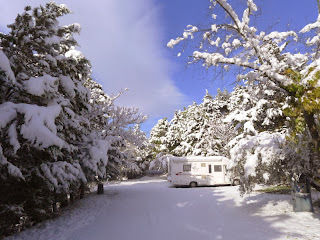 The campsite is a bit ho-hum but we expect that as we head south. 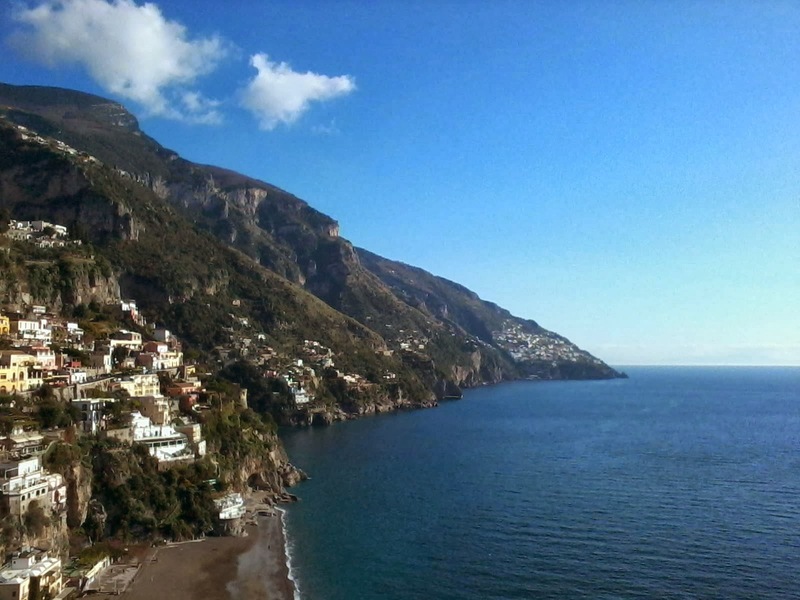 The location is brilliant, walking distance to the ruins, train to Naples, Sorrento, Amalfi etc. we’ve only seen Naples briefly so far, but it’s everything you expect – busy, dirty, big. Today we did the Pompei ruins, which are mindblowing. I wasn’t sure what to expect as so often these thing are over-sold and your expectations are way too high. Pompei does not disappoint. We spent most of the day there and are now very foot sore. It really is something to see and impossible to describe. The whole experience was enhanced by wonderful weather – warm and sunny. Oh bliss. Photos to follow. Of course we found a vineyard!! We’ve been in Tuscany/ Umbria for around 2 weeks now and have been extremely unimpressed with our weather. 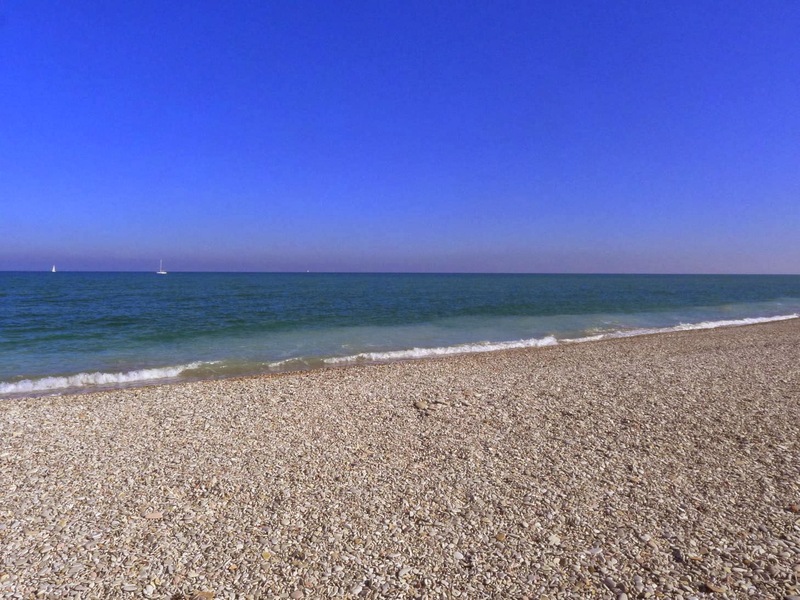 I remember being here in November 2008 and the weather was perfect! What happened?? 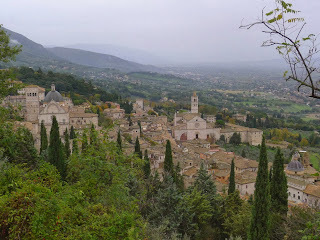 We stayed overnight in Assisi and managed to do all interesting stuff without getting wet, which was clearly the result of masterful planning. It’s a wonderful hill town and don’t let anyone tell you it’s been ruined by tourism, just very slightly tainted. Next stop Siena. 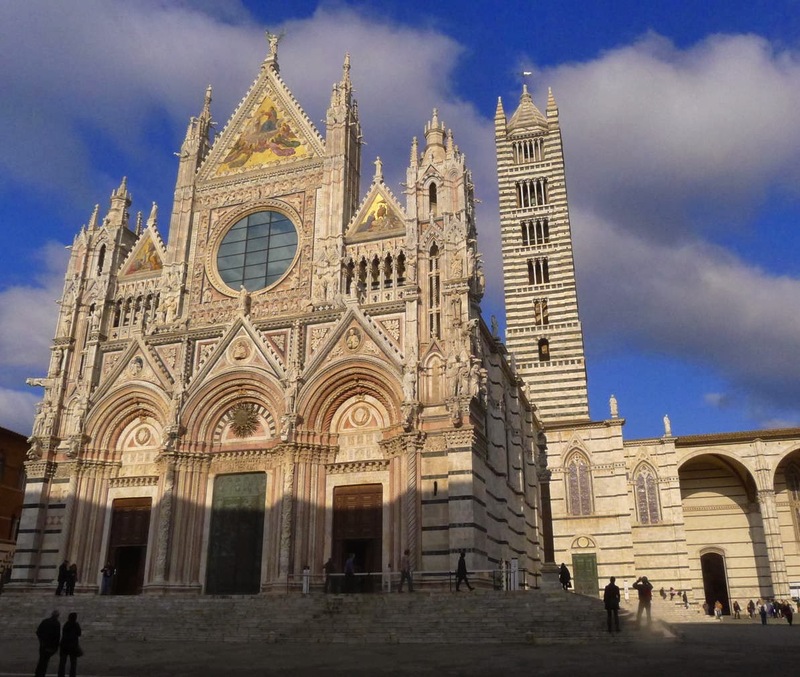 We found a really good campsite 30 minutes walk from the Centro Storico (or any easy bus ride) and ‘did’ Siena. I love Siena, it has a bit of everything and so easy to wander around. The Duomo is one of my favourites – a bit over-the-top but beautiful anyway to my eye. I also adore the ‘extension’ which has been standing there for about 500 years waiting for someone to work out how to finish it. Our Sunday lunch in Siena was a laugh. We walked into an almost empty “Ma and Pa’ style place, only to be invaded by half the population of Guadaloupe! About 40 of them filled the small restaurant and their laughter and chatter entertained us for the whole lunch. Wine wise we’ve enjoyed all the local stuff, Brunello of course, but mainly Chianti, Rosso de Montlacino, Rosso de Montefalco, and interesting whites from Verdicchio, Vermentino and Grechetto. Italian white wine has come a long way in the last 15 years. 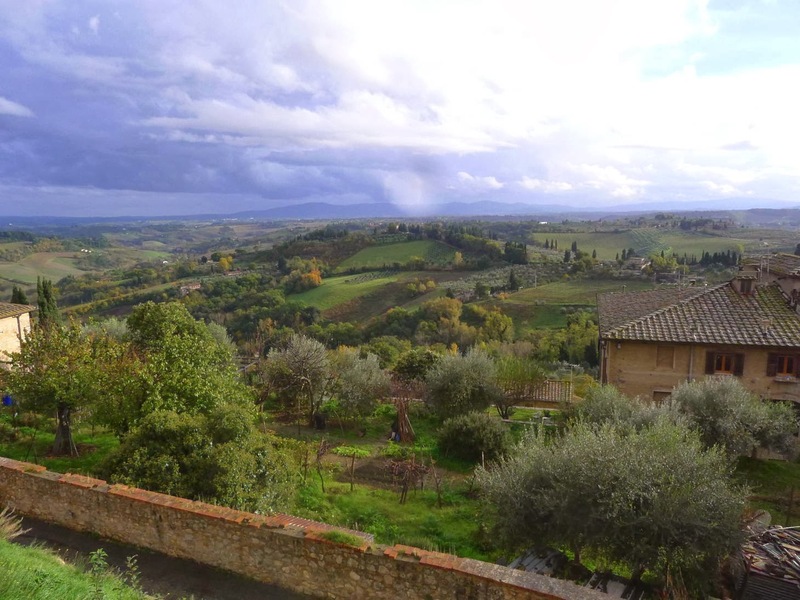 We hired a cheapo car to see the rest of Tuscany as the weather was terrible and I was afflicted with a nasty cold, so not up for much. We toured Chianti, wandered around Montepulciano and Pienza, did San Gimignano, Monteriggioni, ie: ‘the full Toscana experience’. 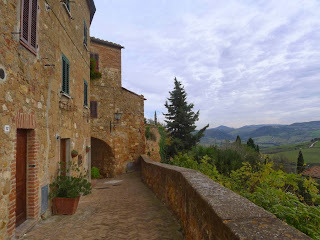 The day we went to Montalcino was probably the worst. 6 degrees, windy and raining. This is my favourite wine town and I was so keen to show it to Lawrence but it was not weather for strolling. We lunched in Montalcino with Sarah (a Canadian living in Johannesburg) and Willie (from Cape Town) who we met in Siena. 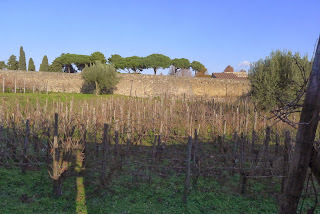 We organised to meet them in Montalcino for pranzo at Grappolo Blu after a tour of major wine producer Castello Banfi. Great fun, but not the weather for the expected activity of sitting in the square sipping Prosecco watching the passegiata. It was very cold. A highlight of our sojourn in Siena was having fabulous neighbours. First Sheena and Brian from UK, who had spent a lot of time over the years in Southern Italy and Sicily and had lots of good advice for us. Replacing them were a couple from Byron Bay (north coast of NSW, Australia). Sally and Doug had also spent time in Sicily and talked us through pros and cons of the various towns and campsites over many bottles of wine and lots of laughs. 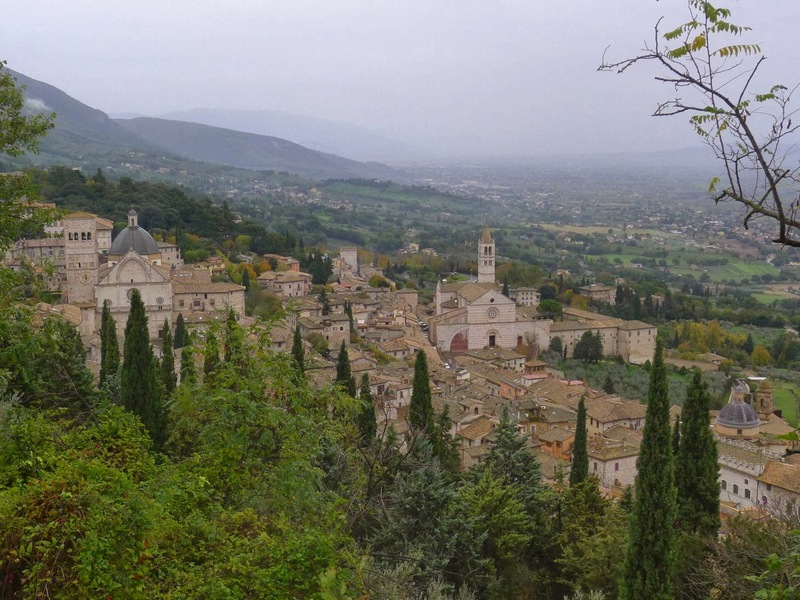 After obsessively checking weather sites for days on end, we decided to go back to Assisi. 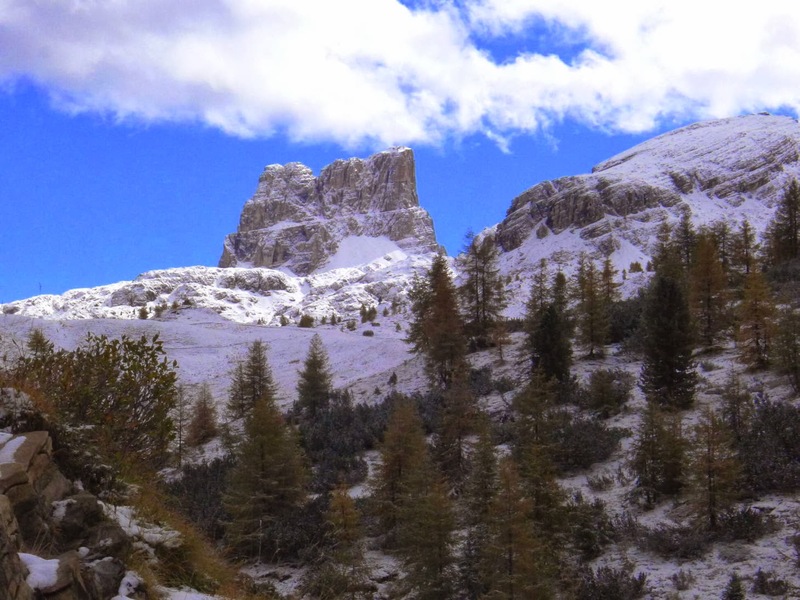 Our new friends had told us about a campsite just outside with easy access to the town, and walking in the adjacent National Park. Seemed like a good plan. It was snowing as we arrived and then snowed for 2 more days. What is it with us and snow?? We never planned for snow, it just wasn’t in the budget. 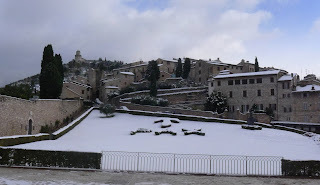 Anyway Assisi in the snow is very pretty and we have photos to prove it. 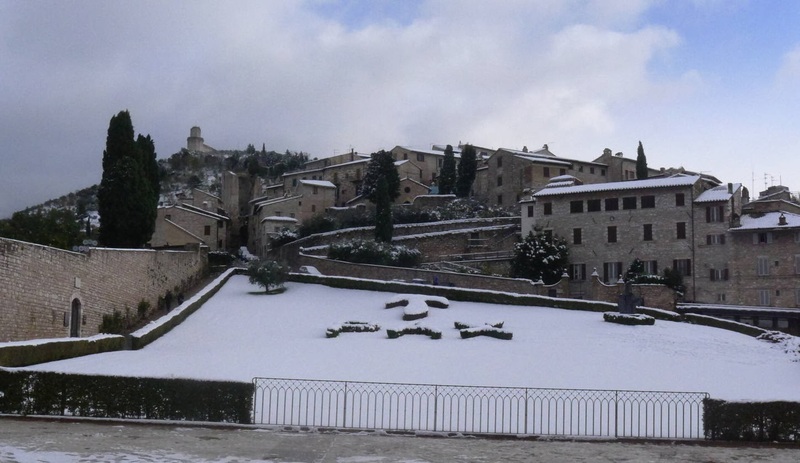 I’ve come to the conclusion that Assisi is gorgeous in any weather, and is most likely my absolute favourite Italian town (well, this week anyway). So, we hired another cheapo car (around 80 euros for 5 days) and have been touring southern Umbrian hill towns - Spoleto, Spello. 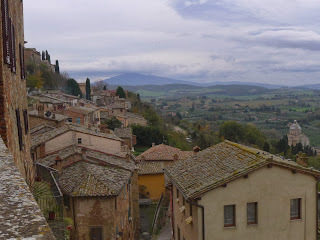 Montefalco, Todi, Orvieto, Bevagna. After the snow we had 3 days of sunny but very cold weather. Any sun is welcome so we weren’t complaining that the mercury didn’t reach double figures. We’ve both been living in our down jackets. It’s hard to believe how cold it has been and today is the first day of winter – are you kidding me??? Hopefully as we head south, thing will hopefully improve. 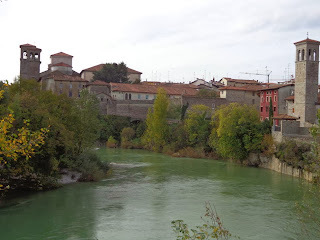 From here will head to Norcia in the southern Apennines and then head towards Rome. Also - I've just realised this is my 100th post!! Thanks for reading. 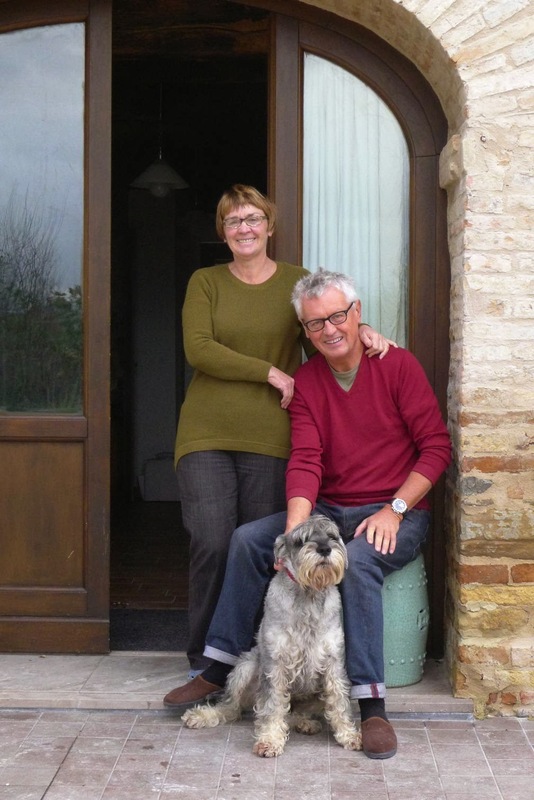 We’ve just spent a wonderful 10 days with Pam and Michael in their divine house in Le Marche. Lawrence has known them since his days in Hong Kong, so it was a very relaxed ‘timeout’ from the road. 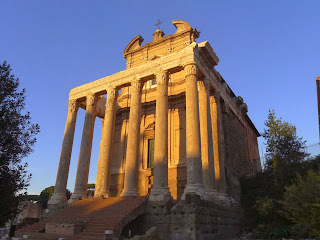 On our way there south from Bologna we stopped at Ravenna on advice from Pam. We were blown away by the mosaics in the Basilica of San Vitale. 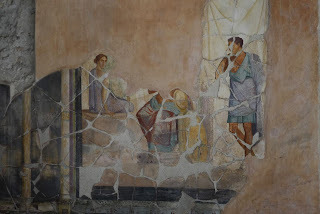 These are not just any old mosaics. 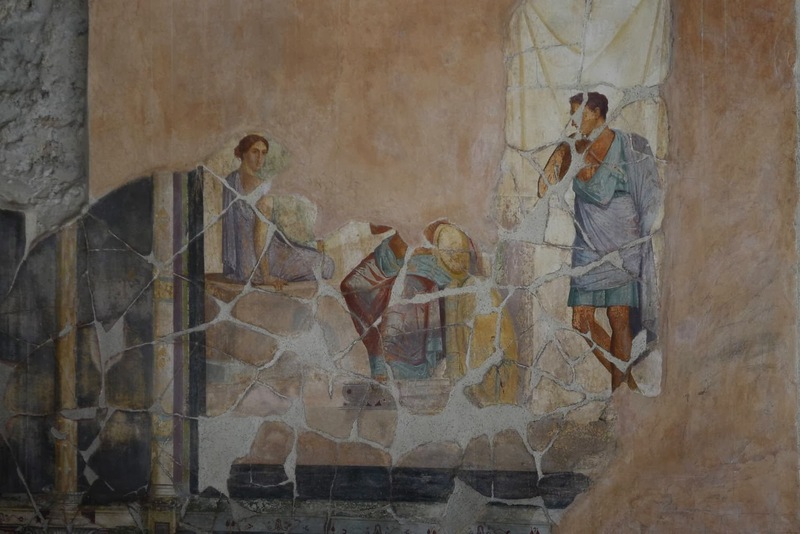 Created in 525 under Emperor Theodoric, these 1500 year old mosaics are so fresh and colourful, they look as though they were laid yesterday, telling timeless stories. They really do have to be seen, to be believed. There is nothing else like them – anywhere. We had some lazy days enjoying being in a large house and I spent time with Pam weeding the extensive garden – simply enjoying the sun. It’s funny how mundane things like weeding become enjoyable when you are itinerant. Pam and Michael bought the place as a virtual ruin 10 years ago and have restored it to beyond its former glory. Max the Wonder Dog came later. We also did some local touring, exploring lively markets, lovely local towns and of course Cantini. 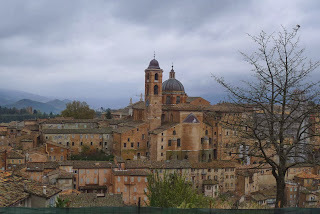 A highlight was Urbino with its Palazzo Ducale and wonderful mediaeval atmosphere. The marquetry has to be seen to be believed. 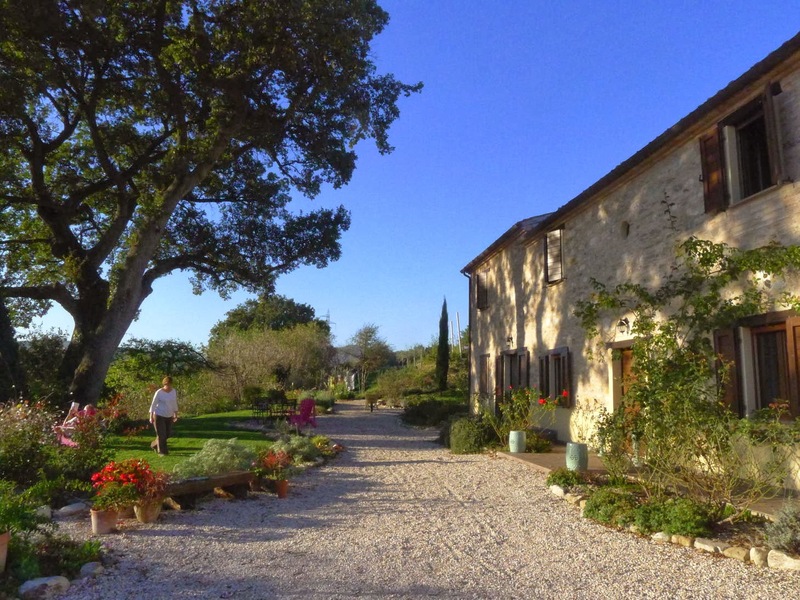 Pam, fortunately for us, is a wonderful cook and we had many lovely meals with local wine, enjoying the warmth of open fires. Pam and Michael organised a caving trip before we had arrived and I wasn’t quite sure what I had let myself in for. 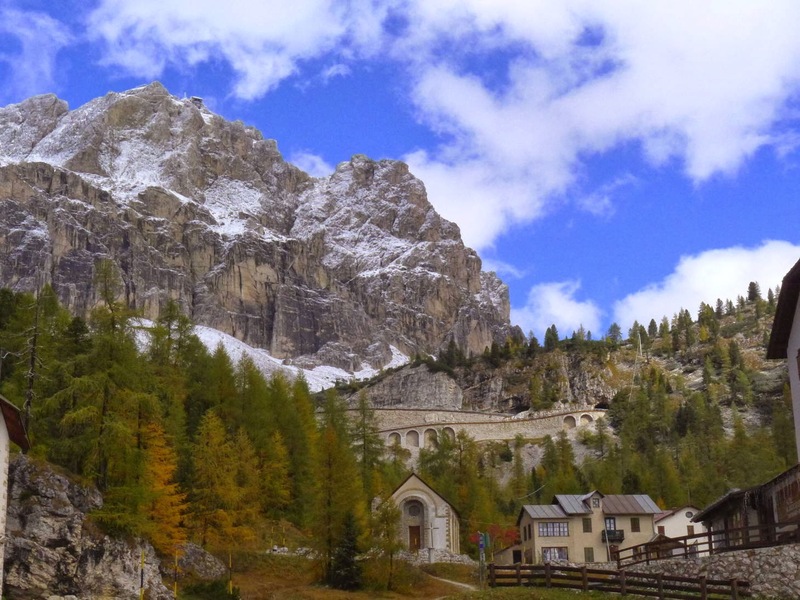 The Frasassi Caves are the largest in Europe and can be seen on a rather tame tourist walk. This was not for us – apparently! We donned overalls, wellies, helmets with head torches and gloves, and went “off piste”. Now, I’m not the bravest person in the world, but can put on a front when required. This was a challenge. 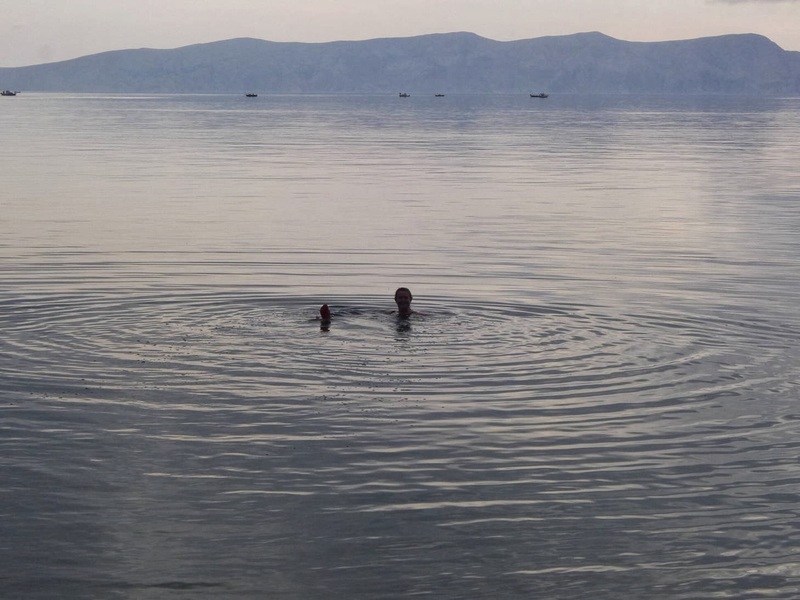 We crawled through tunnels, slid on our backsides, swung across pristine ponds (so as not to disturb the water – would have been easier to walk through it) and sat in complete darkness, the likes of which I have never known, not even in the Australian desert. The Guides were fabulous and just ignored my cries of “you want me to put what where?” “Left foot here, hand there, swing across”, mostly in Italian, but I got the message. It was a real adventure and the caves are of course simply stunning. Rooms are the size of cathedrals – big ones. This was of course followed by a wonderful lunch with friends that also live in the area. Inside of a cave with the lights out!! November 13 was Lawrence’s 65th birthday. Yes, I’m officially married to an old age pensioner (without the pension). Yikes, this is not what I signed up for! To celebrate we went to lunch – now there’s a surprise. We went to the regional truffle capital, Acqualagna, and had our first real truffle experience. It was a simply delicious lunch with wonderful wine, but to be honest, I think porcini has more flavour. OK, call me a Philistine! 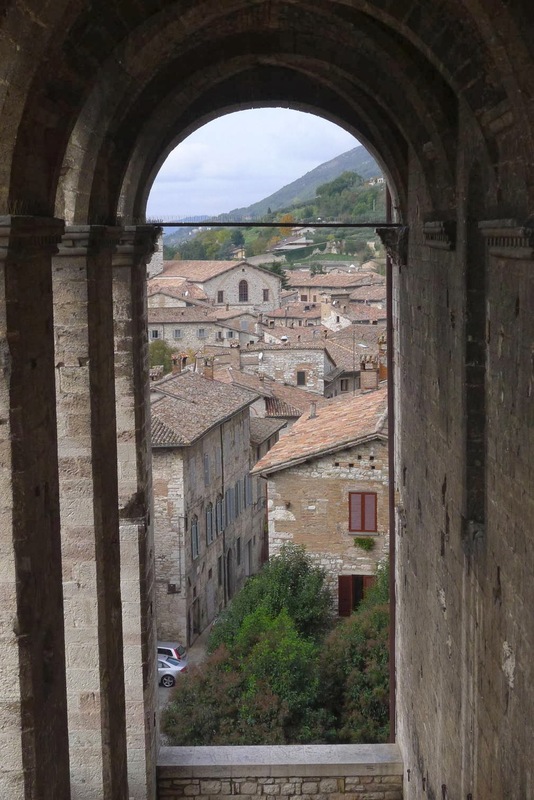 So now we are in Assisi, my favourite town in Umbria. It’s even more beautiful than I remember from my first visit in 2006. 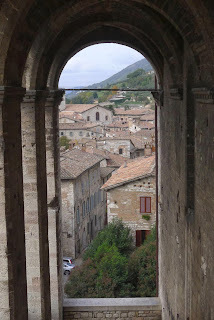 We stopped in Gubbio on the way, another stunning hillside Mediaeval town, larger than we expected. 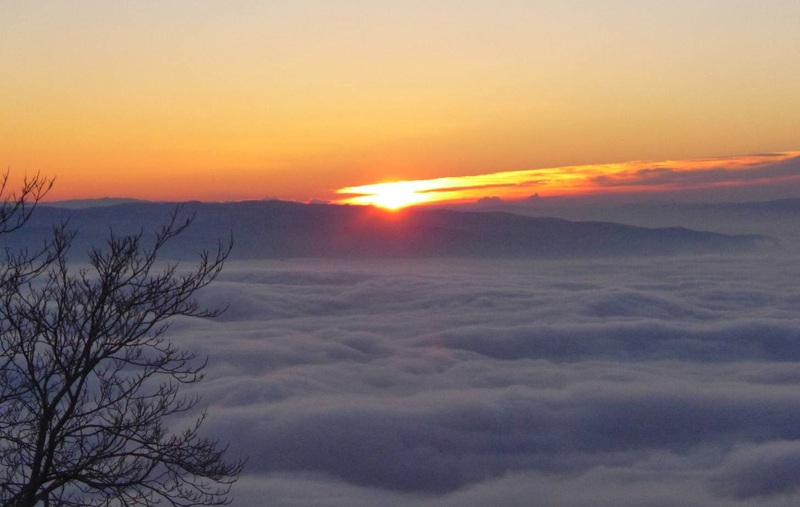 We’ll finish exploring Assisi tomorrow and then check out more of what Umbria has to offer. I’m not sure you can really call island hopping on car ferries ‘cruising’, but it’s the closest we came. After leaving Slovenia we did an overnighter in Zagreb, Croatia’s capital city. 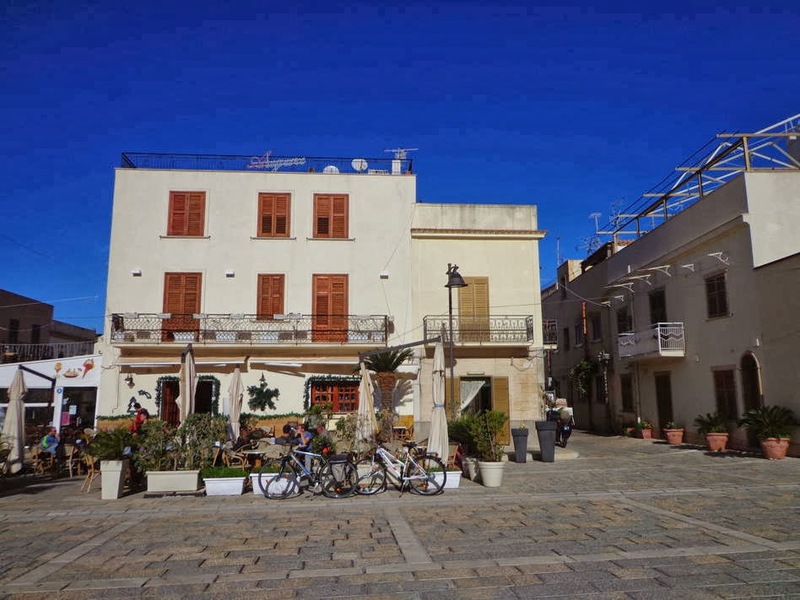 The compact old centre really had a great vibe to it with a high density of cafes and bars. The national sport seems to be sitting about in the sun sipping coffee or wine. We fitted right in. We checked out all the obligatory churches and other grand buildings and then joined the locals in the cafes and bars. The national dish of Croatia seems to be pizza, but we managed to have local dish of venison goulash for our dinner, accompanied by some very ordinary wine. The whites, mainly Malvasia, are rather lovely, but reds can leave a lot to be desired. 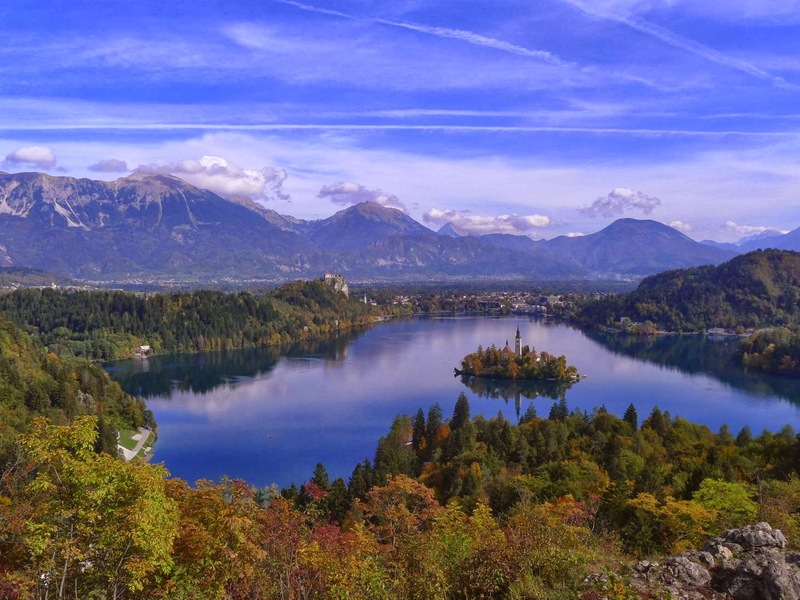 From there we headed to the coast through lovely country, similar to Slovenia – not surprising really!! Our first glimpse of the Dalmatian coast was breath-taking, but sadly the clouds came in, coming closer and closer until the whole region looked as though Christo had arrived and wrapped everything in grey silk. We were hoping for the azure skies and turquoise waters of the tourist brochures, but we got 50 shades of grey instead. Even so our first camping spot by the sea was lovely and we got a decent sunset, so musn’t grumble. 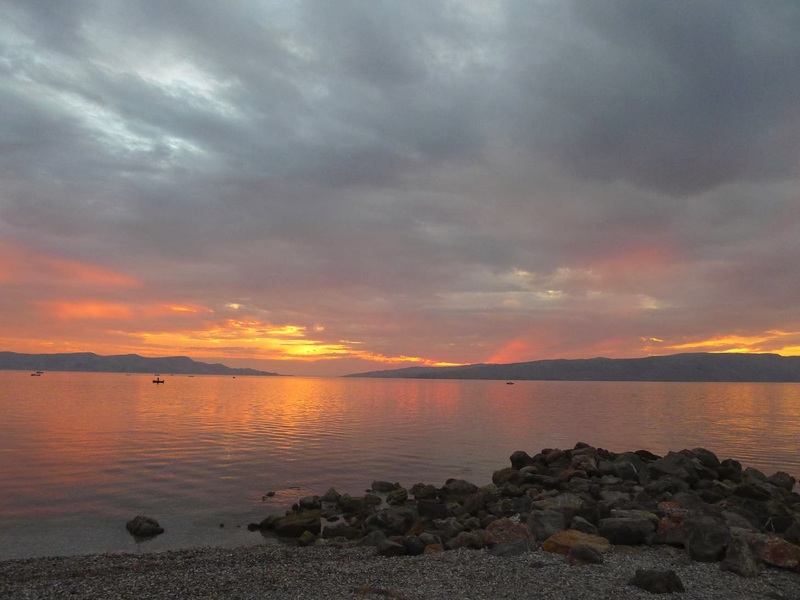 From Senj we head to the island of Krk. 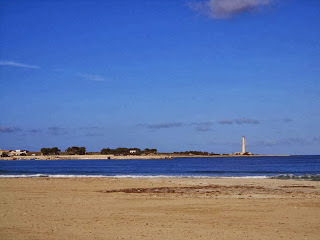 We stayed 2 nights and had good wander around – not the world’s most exciting island, but we liked it. 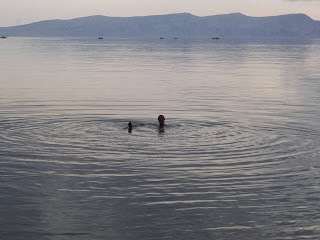 Next stop the island of Cres, but the damn sea fog came in and we saw virtually nothing. 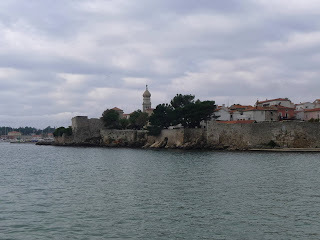 We stayed in Pula on the Istrian Peninsula, but same thing – just shades of grey. 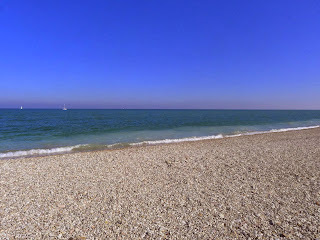 We really didn’t see the Adriatic Sea at it’s best. Driving north back into Italy, we stopped in Trieste and camped in a rather odd spot, more like a trailer park, with lots of permanent residents. 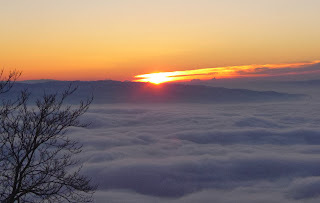 Still, it was high up above Trieste with great views and decent restaurant. Can’t complain about a decent Linguine alle Vongole. Trieste is an interesting port town but not on the ‘don’t miss’ list for future reference. James Joyce wrote The Dubliners and A Portrait of an Artist as a Young Man here, so must have something going for it. I now feel obliged to read these. I’ll let you know how I get on! We are now in Friuli region and parked by the cemetery in Udine. At least the neighbours will be quiet. 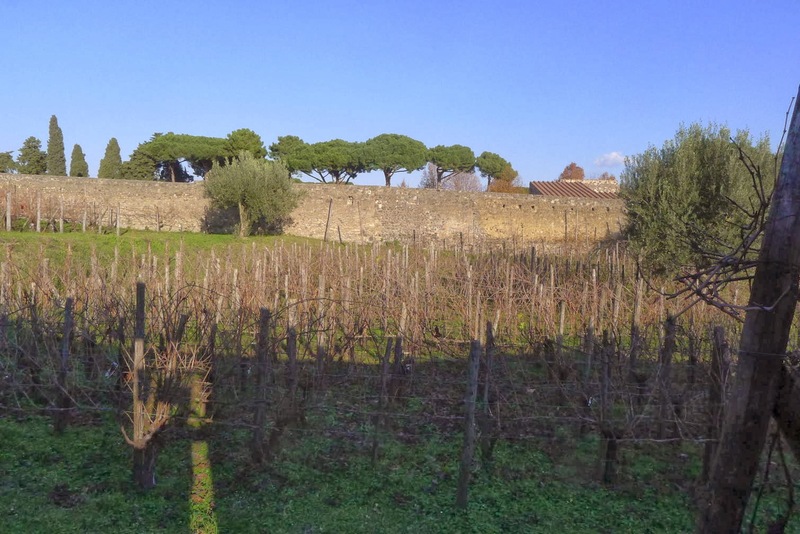 There are no camping grounds in the region at all, which is a shame as it is a major white wine region and might have been interesting to check out a few producers. We settled for trying a few glasses of the local Friulano in a couple of bars. From here we will head to Bologna for a few days and then on to Le Marche to stay with some friends of Lawrence’s from way back. We’ll stay a week if they’ll have us. It’ll be nice to stay put for a while as we have been on the move for a while. 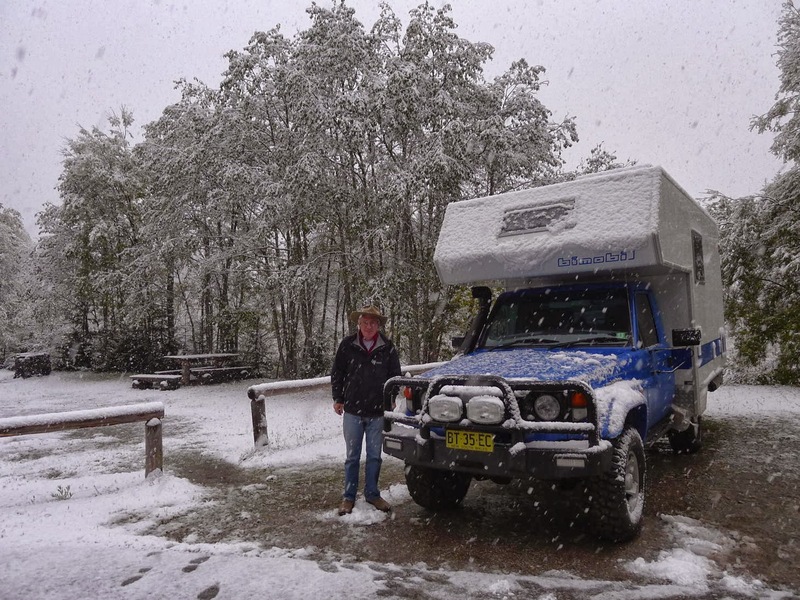 We woke last Saturday morning, camping at 1250m to a winter wonderland. 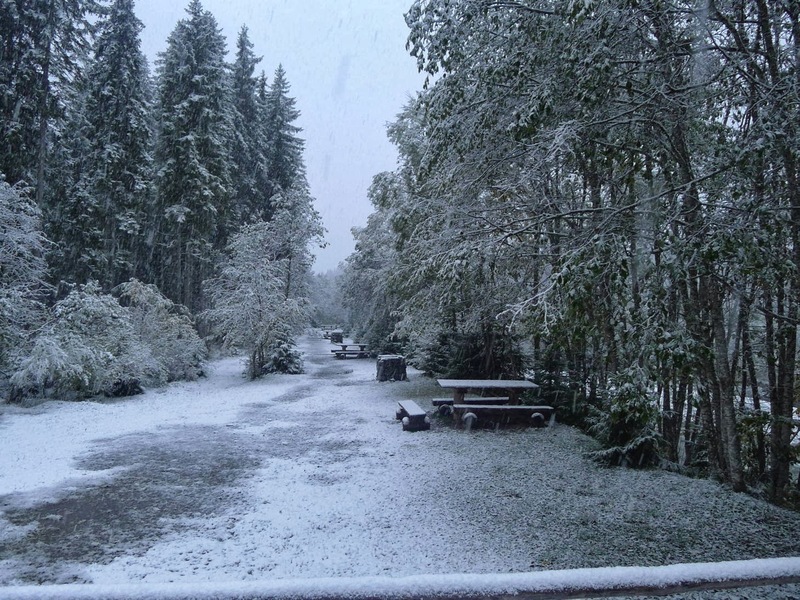 Lawrence got up to make my cup of tea and said casually “it’s snowing”. “What!” I exclaimed, and pulled up the blind to see fairy tale whiteness all round. So pretty from the comfort of your warm bed, but a different story having to pack up and get moving in it. The snow turned to rain as we descended and we had a very low cloud, and a ‘no view’ drive – so different from the day before. 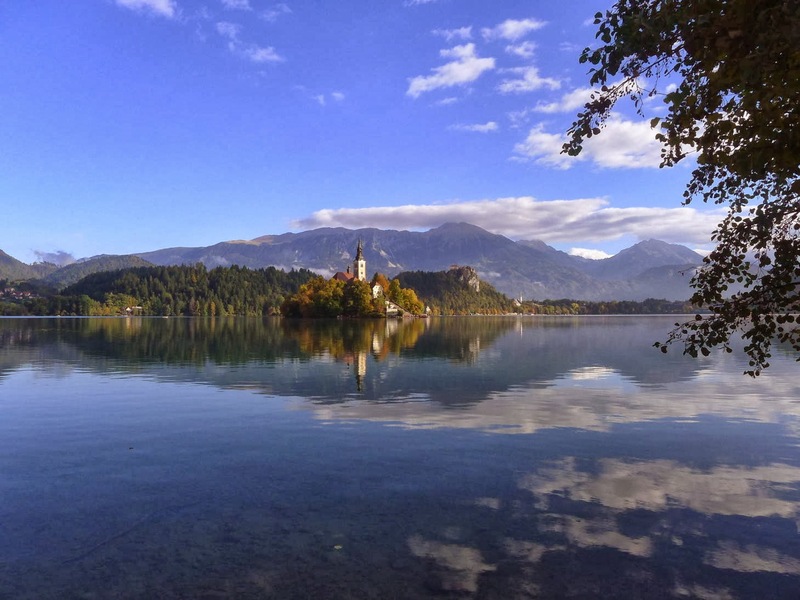 However we made it to Slovenia and were happy to find a lovely campsite at Lake Bled. 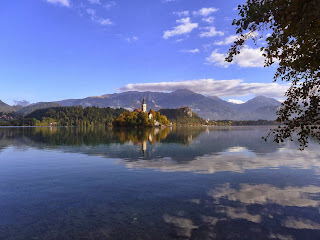 We spent the next 2 days at Lake Bled cycling and walking, such a pretty spot! The highlight was meeting a young Australian couple from Newcastle (north of Sydney). They are on their ‘odyssey’ in Trevor the Trannie, a Ford Transit van that is literally a bed on wheels (onourodyssey.wordpress.com). They invited us to dinner and the amazing Sarah cooked us a 3 course Italian meal, on a one burner gas stove, sitting on the ground!! She made Carprese Salad with bruschetta, gnocchi with mozzarella AND an authentic tagliatelle carbonara, absolutely delicious. We supplied the table and chairs. It was about 5 degrees, but enough red wine and we all coped. It was a meal we won’t forget. 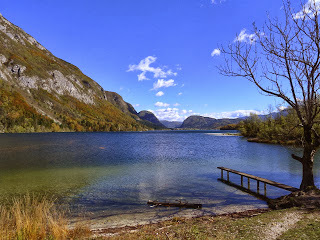 From there we drove to Lake Bohinj, another lovely location and did a brilliant 3 hour walk around the lake. 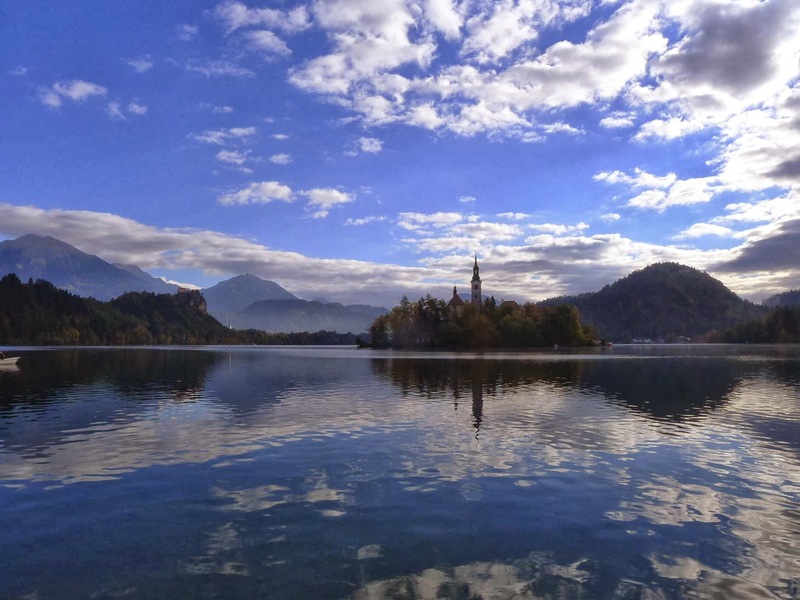 Slovenia is, simply, pretty. Gentle mountains, pretty streams, rural landscapes, all bathed in the soft colours of autumn. Next stop Ljubljana, the capital. We arrived to warm sunshine, so the first thing we did (no, not open a bottle of wine! ), was the washing! The drive was a bit more exciting than expected as the road we hoped to take was closed, but we didn’t find that out until too late and needed to back track and take very long road with umpteen hairpin bends – quite a journey, but quite spectacular. The city itself is small, compact and few hours can do it justice. There is a castle on the hill, but to be frank, it was restored to point of losing all its charm and character. A highlight was stumbling upon an Orthodox church where we met one of the caretakers who gave us an insight to the church and its history. A truly beautiful building, built in the Greek Cross style. From there we drove to a campsite near the Croatian border in the southeast. We want to see Zagreb, but there is nowhere to stay, hence this site. 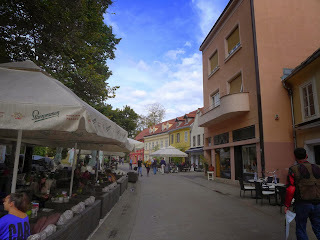 It’s like a small town with several restaurants, a hotel, villages, water parks, fun parks, a spa, a wellness centre etc. It would be hell in the high season but, right now, it’s lovely. We need our bikes to get around, it’s so large. 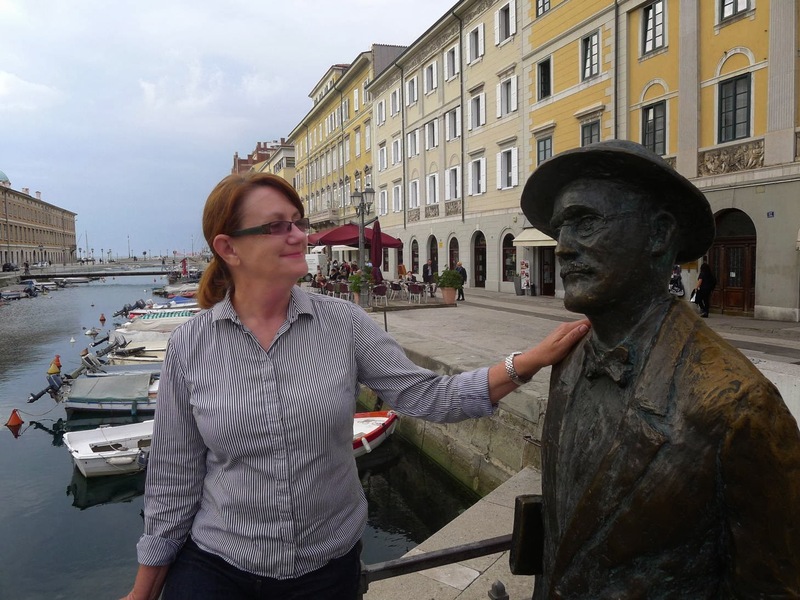 We thought that we could get the train to Zagreb from here, but the timetable is unworkable, so we’ll stay overnight in a swank hotel and leave Boris to his own devices. 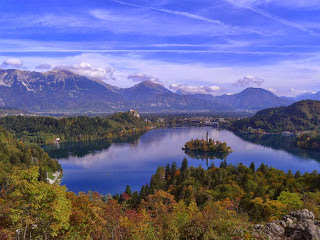 Today (Sunday) we did a 2 hour hilly bike ride through rural Slovenia. We rode through small pretty hamlets with unpronounceable names and steep vineyards, smiling politely at men with shotguns. We followed this, of course, with our traditional Sunday lunch, which turned out to be a very low key affair but the food was tasty and well cooked. I think this is the first restaurant we’ve been to without a wine list. The house wine was ‘interesting’. Boris still attracts attention wherever we go. Are you really from Australia? How did you get it here? How will you get home? Where are you headed? “Vladivostok” I say, but really people are just interested and want to know what you are doing. It’s so easy to meet interesting people in campsites in Europe. Now that you all have bad John Denver songs on your brain, I'll show you some photos of our drive today. It was so extraordinary, that I thought a blog should be dedicated to it. 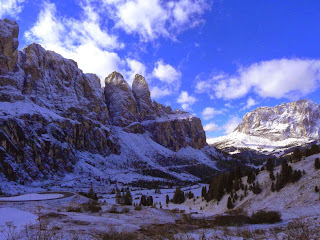 You don't need any description from me - just look at these Dolomites in the snow - with sun shining. 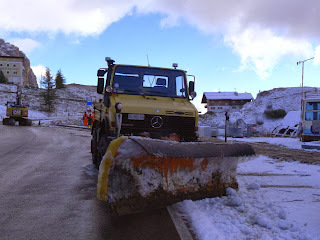 This is what a Unimog is meant to be used for! At 2200 metres and about minus 2 degrees. 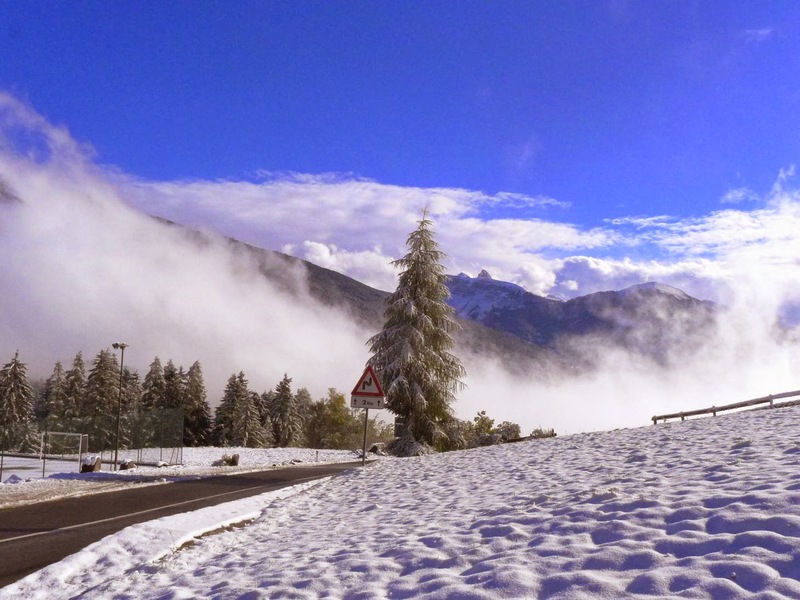 It's impossible to describe what we drove through today, and photos do not do it justice. Suffice to say, it was probably the most amazing landscape we have seen to date. 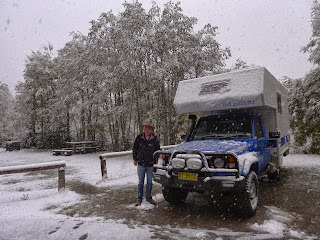 We are now camped in 'the wild' and waiting to see if it will snow tonight. It's certainly cold enough, but fortunately Boris is very well insulated. It's about 2 degrees outside.